This is part 2 in a 3-part series on finding relief from pelvic pain through physical therapy, yoga, and other complementary therapies. 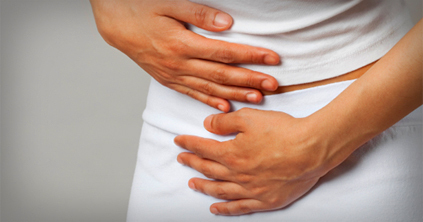 Part 1 discussed how to recognize pelvic pain, and what therapies are available. I have pelvic pain due to a non-relaxing pelvic floor. I cannot even sit down without pain. I am already doing pelvic physical therapy and have had multiple therapies (see below). What can yoga do to help me find relief? Your health care team could include: ob/gyn, midwife, or nurse practitioner, women’s health physical therapist, behavioral psychologist, naturopath, rheumatologist, or internist. First – Ask your team member(s) for a referral to a women’s health PT. In all states, you have direct access to a PT as a specialist, but your insurance company may limit your benefits and require a referral, even though it is not legally necessary. Second, consider the benefits of combining the best of conventional and integrative medicine. Yoga prescribed by a health care provider (medical therapeutic yoga) includes breathing, relaxation, meditation, and mindful movement that work to relax the pelvic floor and retrain muscle groups in the pelvic area to improve neural patterning, motor control, and psychoemotional well-being. Ask your doctor or therapist about the potential benefits of prolotherapy for facilitating joint stability and reducing pain. Ask your therapist about therapy for the obturator internus, often implicated in pelvic pain. Ask about neuromuscular re-education for the hip rotators and pelvic floor. Ask about the benefits of getting a CRP (C-Reactive Protein) test, which identifies systemic inflammation, a possible contributor to chronic pelvic pain. Ask for a salivary diurnal cortisol test, which can identify presence of HPA Axis Dysregulation, a very important consideration when treating pelvic pain and women’s health in general. Dysregulation is directly related to pain, fatigue, and other chronic disease processes. Begin a mediation practice. Meditation is well-supported in the literature to regulate the HPA Axis and improve neuroendocrine function. Learn about your pelvic floor. A PT can teach you how to identify weaknesses or hyperactivity in different areas of the pelvic floor, and also teach you how to address the problem(s). Don’t overexercise. Pelvic pain has many causes, but in women who seem relatively “fit,” sometimes the cause of pain can be traced back to overtraining or training the wrong muscle groups. A PT can help design an exercise program that fits your needs as a woman. Consider that loss of range of motion or mobility in a seemingly unrelated joint, such as the spine or knee or hip, could actually be contributing to pelvic pain. A PT can evaluate this possibility and determine whether or not another joint is contributing to, or is being affected by, your pelvic pain. Evaluate your lifestyle and personality. Are you a “go-getter” or have a “type A” personality? Are you a mom who works, cares for children, and otherwise tries to do everything just right? Are your rigid in your scheduling, exercise regimen, or on the other hand, are you a mom that never received postpartum physical therapy? If so, these are all reasons that could contribute to pelvic pain. Consider Ayurvedic medicine. Ayurvedic medicine can be another viable option for treatment, but only in conjunction with your current therapies; and with discussion and approval of your physical therapist or physician. Finally, learn why all new mothers should be receiving pelvic floor physical therapy after childbirth. Postpartum PT is the norm after childbirth in Europe, but in the US no mother receives routine PT after giving birth. This is why, even 20 years after giving birth, a mother can still be considered “postpartum” if the problems she is having are pregnancy and birth related. 1.Faubion SS, Shuster LT, Bharucha AE. Recognition and management of nonrelaxing pelvic floor dysfunction. Mayo Clin Proc. 2012;87(2):187-193. doi: 10.1016/j.mayocp.2011.09.004; 10.1016/j.mayocp.2011.09.004. 2.Cusi M, Saunders J, Hungerford B, Wisbey-Roth T, Lucas P, Wilson S. The use of prolotherapy in the sacroiliac joint. Br J Sports Med. 2010;44(2):100-104. doi: 10.1136/bjsm.2007.042044; 10.1136/bjsm.2007.042044. 3.Kim WM, Lee HG, Jeong CW, Kim CM, Yoon MH. A randomized controlled trial of intra-articular prolotherapy versus steroid injection for sacroiliac joint pain. J Altern Complement Med. 2010;16(12):1285-1290. doi: 10.1089/acm.2010.0031; 10.1089/acm.2010.0031. 4.Streeter CC, Gerbarg PL, Saper RB, Ciraulo DA, Brown RP. Effects of yoga on the autonomic nervous system, gamma-aminobutyric-acid, and allostasis in epilepsy, depression, and post-traumatic stress disorder. Med Hypotheses. 2012 May;78(5):571-9. doi: 10.1016/j.mehy.2012.01.021. Epub 2012 Feb 24.